When I lived in the city, garage sales were always on Saturday and Sunday. I thought they were like this everywhere. But in the town I live in now, garage sales are always on Friday and Saturday. I've lived here for six years and it still surprises me. So this morning when we were about to load up and go help my Mom, and I saw a bunch of cars and people in the neighbor's driveway, I couldn't figure it out. "I wonder what's going on over there?" I said. It was Mr. Magpie who clued me in. "What do you mean? The garage sale?" Did.... you say... garage sale???? The pressed glass bottles were what I found first, then the vintage books. 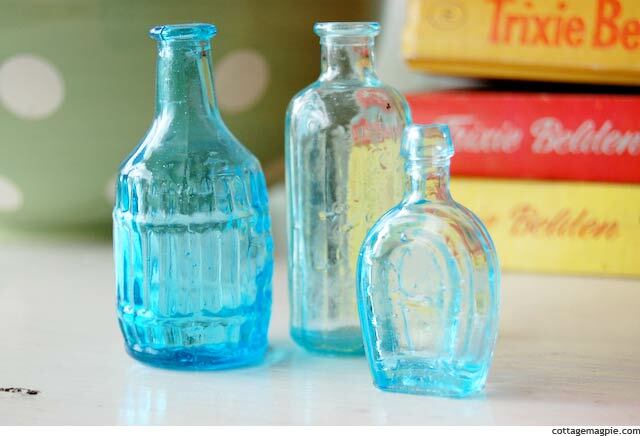 The tiny turquoise bottles I found last. They are to add to Baby Girl's little vintage tea set. In the middle of it all, I found the vintage lunch boxes. Oh. My. There were about a dozen. This blue one was the least expensive at $5, so I brought it home. Say hello to my soon-to-be new sewing kit! All of those treasures were about $15, and I came home. But I couldn't forget that other lunch box, the bright red one with the push button closure. I actually sent Mr. Magpie back for it, and that set me back another $10. Ouch! But I love it. It's going to be our new first aid kit. All the details and the colors just make me so happy. I don't actually go to garage sales that often. They're fantastic and I love them. But we are very careful with money, and I have a leeetle problem leaving treasure behind. So it's best that I just not go into the den of temptation as it were. Now if I can just get that last pile of junk out of the workshop, I can start displaying some of these things!!! Guess I know what I'm doing this weekend. Ahem. How about you? What are you doing this weekend? Any garage sales in store?